In late 1990, Columbia Sales International became the exclusive U.S. and Canadian sales representative of Metaux Speciaux of France for Sodium, Potassium, Sodium Peroxide, electonic-grade Chlorine, and Vanadium Chlorides. At that time, there were two producers of Sodium in the U.S. In 1992, RMI discontinued the production of Sodium, which allowed Metaux Speciaux to enter the U.S. Sodium market. Up until that time, Metaux Speciaux, now known as MSSA SAS, had some minor sales of specialty grades of Sodium in the U.S. Their U.S. sales of Sodium grew dramatically over the next 20 years . With the shutdown of the only remaining U.S. Sodium producer, Chemours, in late 2016, MSSA is now the only producer of Sodium in the western hemisphere. 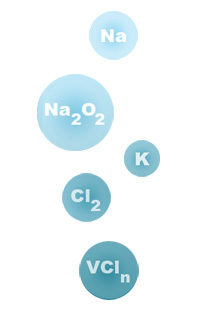 MSSA produces both technical and high-purity grades of Sodium. Several of these grades are produced nowhere else in the world. For more details about the activities of MSSA, please go to MSSA’s website. In 1999, KMR Industries LLC, a joint venture between Columbia Sales International and Creative Engineers (CEI), was formed for the purpose of producing sodium dispersion. This product is mainly used in the treatment of PCBs, a toxic product and persistent organic pollutant banned in the U.S. in 1979. By reacting sodium dispersion with PCB-laden oils, the PCBs are rendered harmless and can easily and safely be disposed. KMR Industries has a plant in New Freedom, Pa., and ships sodium dispersion throughout the U.S. and Canada, as well as to several overseas locations. In addition to MSSA and KMR Industries, the business of Columbia Sales also includes the representation of Nisso Shoji of Japan for several products, as well as export activity of U.S.-produced products.